Surely an Amazon Echo won’t save me money, I hear you ask. While this might not be one of the obvious benefits of an Echo, it actually could! 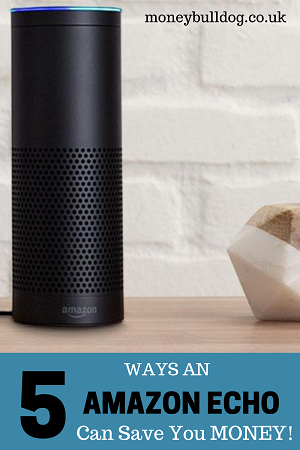 Here are 5 great ways an Amazon Echo* could save you money. One of the first ways you could save money with an Echo is on music streaming. Most streaming services in the UK like Spotify, Apple Music and Amazon Music Unlimited cost around £9.99 per month. When you buy an Amazon Echo device, however, Amazon will let you have Amazon Music Unlimited* on that one device for just £3.99 per month. If you’re an Amazon Prime* member then – depending on how many songs you want access to – you may not have to pay anything extra at all in order to stream music via your Echo. This is because Prime members get access to a service called Prime Music for free. This will allow you to play various songs from many different genres at no extra cost via your Echo. The Amazon Echo isn’t just a stand alone device, it can also connect up your home to act as a kind of smart hub using Alexa Smart Home Devices*. These include Smart Thermostats, Smart Plugs, Smart Bulbs and more. If you set your home up right then it is easy to see how these could save you money. You could save not only on utility bills but also on how long your bulbs will last. Another way you could save money with an Amazon Echo device is on phone calls. Amazon Echo devices and the Alexa App comes with a wifi calling feature built-in. This means you can call anyone with an Echo or the Alexa app via your wifi absolutely free. If you’re looking to improve your personal finances then there are plenty of books out there to help you. If you find that you don’t have the time to sit down and read these books, however, then perhaps listening to an audiobook version via an Echo might be just the solution you need. Not only will the advice contained in some of these audiobooks help you to save money, but using a subscription service like Audible* could help you to save big on the usual cost of these audiobooks too. While this blog doesn’t currently have a podcast, I know that there are many out there that do. Who knows, we might start our own one day too so watch this space. Amazon Echo devices are able to play a lot of different podcasts and there are also Amazon skills such as the AnyPod skill* which are supposed to help improve the podcast experience and functionality. To test this, I asked Alexa to play the Dave Ramsey show and it played it via Tunein. With Amazon’s latest cost cutting drive when it comes to Echo devices, there are some really good bargains to be had when you buy an Echo* right now. With the money saving aspects of the Echo mentioned here paying you a little money back on a regular basis, maybe you will decide that purchasing an Echo is worth the money. I’ve certainly enjoyed using mine to date.